Barely beaten tracks are an increasingly rare find for travellers in this ever more accessible world. Yet on the shores of Tomini Bay on the Indonesian Island of Sulawesi, one such place still exists. Gorontalo Province lies on a peninsula extending from the northeast of the flower-shaped island of Sulawesi, reaching out towards the Philippines. This peninsula, known as the Minahasa, is bounded by the Celebes Sea to the north and the Gulf of Tomini to the south, and it is on this southern ocean boundary that the provincial capital, Gorontalo City, lies. The term City, however, is deceptive, since Gorontalo is more akin to a rural town, where chickens risk all as they cross roads that are traversed by over-laden scooters and motorised rickshaws, known locally as bentor. Along the main streets, double-parked horse-drawn carts contrast sharply with shops that hint at influences of the modern world—the mobile phone accessory outlets that fuel Indonesia’s fascination with mobile communications. This is an obsession that has led the country to become the world’s fourth largest user of cellular phones. Yet, despite these few signs of the emergence of modern day culture, Gorontalo City remains distinctly traditional and a world away from the usual hustle and bustle you expect to find in an Indonesian city. Legend has it that when the seas subsided, Gorontalo appeared on a plateau amongst three surrounding mountains. Whether the legend is true or not, there is no denying that the landscape here is ruggedly beautiful, comprising steep cliffs and valleys that channel fresh water on a downward journey toward the sea, cutting swathes through the soft limestone on the way. It is at the coastline where the vulnerability of limestone to natural erosion is most strongly evident and the impact on the underwater topography is dramatic. To the east and west of Gorontalo City, steep cliffs plummet vertically into the sea and underwater channels and gulleys lead the way to the extreme depths of the bay. These are often beautifully interlaced with catacombs of chimneys, caverns and tunnels, providing refuge for some of Gorontalo’s numerous species, some of which are endemic. Tomini Bay is over 4,000 metres deep, and the seabed drops so rapidly that it is common to see open ocean species such as whales, dolphins and strange pelagic invertebrates close to the shoreline. A plummeting seascape so close to land also has other benefits, in providing a near-shore habitat for sessile species that would otherwise be vulnerable to shallow water wave action and therefore in the depths they can thrive. Descending past 20 meters, you enter the domain of the giant sponges, firmly gripping the porous limestone while the nutrient rich currents wash over them. Simple multi-cellular animals rather than plants, there are around 8,000 described species of sponge, with the total number of species thought to be upward of 15,000, classified collectively under the scientific phylum Porifera, which means “pore bearing”. Filter feeders, they also lack any distinct digestive system and rely on their collar cells to force water through their structures, bringing in nutrients and oxygen and taking away carbon dioxide. Here in Gorontalo’s depths they are able to grow to enormous sizes. Amongst Gorontalo’s healthy sponge population, a phenomenon has occurred that illustrates perfectly how local conditions can influence evolution. The sponge in question is Petrosia lignosa, a species found only in Sulawesi and the Philippines and first described by renowned zoologist Henry Van Peters Wilson in 1925. In Gorontalo waters it grows with an intricate, deep swirling pattern etched on its surface, which so far has only been observed here. Local dive pioneer Rantje Allen was the first man to document this unusual morphology and has christened the species with a name befitting the bizarre patterns—“Salavador Dali”—named of course after the surrealist Spanish painter. 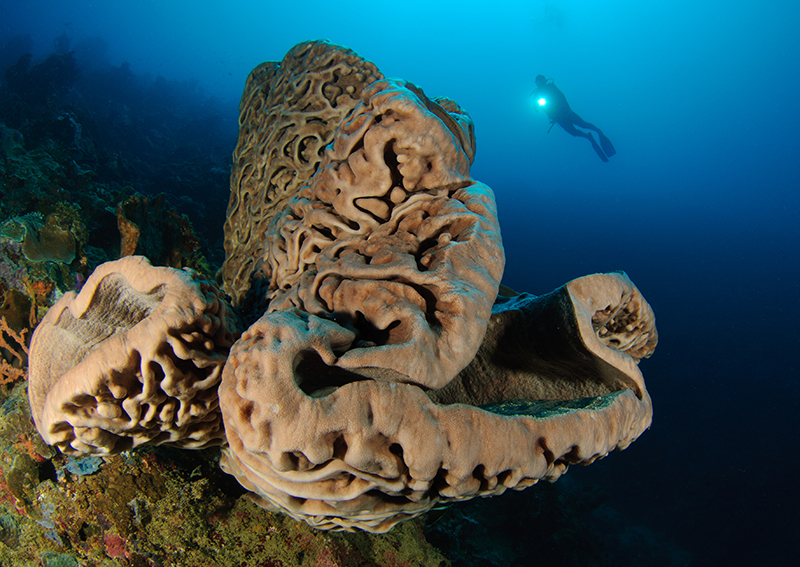 These sponges come in various shapes and sizes, the largest can be over three metres in length. All of them display the distinctive patterns, from juveniles of only 20cm in length to those that have reached gargantuan sizes. The Salvador Dali’s have been observed in two colours, a dark shade of brown, sometimes with a green tint, or light grey for the ones that dwell out of direct sunlight. Allen has christened this variety the albino Salvador.